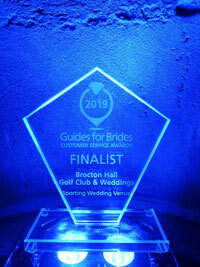 Huge congratulations to “Team Brocton” on being runners-up in the Guides for Brides 2019 Customer Service Awards, with 300 venues in their category this was a great achievement! The prestigious event was held at the Bodleian Libraries in Oxford yesterday, Thursday 28th March. This was the first time that we had held a Junior Captain’s Drive-in and, as always, Hannah was up for the challenge, electing to drive from the white tees with Vice-Captain Ethan.